Can water catch fire? The question may surprise anyone in senses. Yet any person who keeps an open eye for social and political movements would know that when masses forge ahead, breaking millennia old chains of slavery, then not only sky can be pierced, but water too can catch fire. 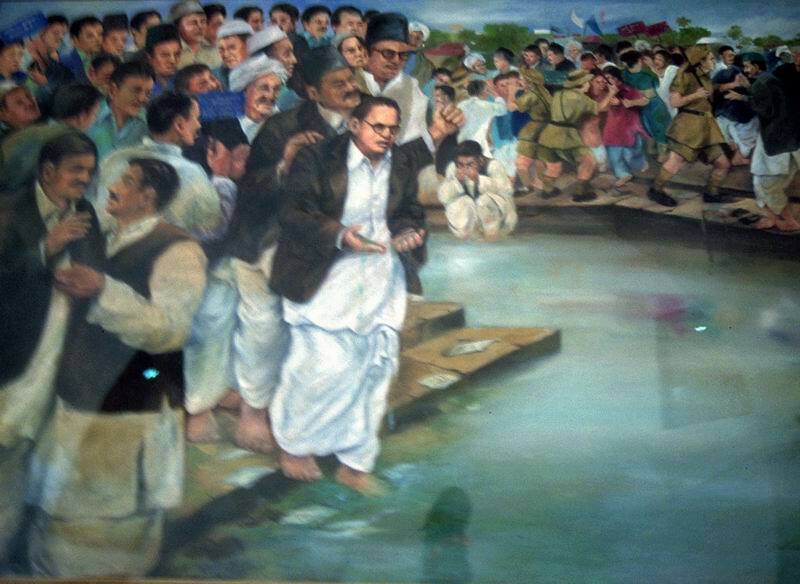 2017 is the ninetieth anniversary of Mahad Satyagrah when thousands of people had gathered at Mahad in Maharashtra to challenge the practice of untouchability by drinking water from a public pond. It may appear just one event in one corner of the country, but it gave voice to many new notes of rebellion in the social and cultural landscape of India. It needs to be noted that this historic satyagrah is known as the Mahad Revolution Day in the social movements of Western India, when in the first phase Ambedkar and his followers had gathered to drink water from Chavdar pond, and in the second phase om 25 December, 1927 he had publicly burnt Manusmriti. It may appear that all they did was to drink water from a pond, yet this one simple act was a declaration of revolt against centuries old pernicious practices of Brahminical caste system. They openly challenged injunctions ordained by religion, which did not mind animals drinking from a pond, but would punish a section of humanity or doing it. It is not without reason that in Marathi it is said with pride, that it was the day when’ water caught fire’. This was a symbol of the self respect of Dalits, and announced their arrival at the forefront of the battle for equality. This declaration of their basic rights by Dalits forever changed the face of Indian politics and social movements. It is unfortunate that there is little public discussion on the significance of this historic satyagrah, and its current relevance. However, this is an opportune occasion to discuss challenges before, and potentialities of the Dalit movement after Ambedkar. It needs to be understood that not many remember the two twin enemies of the exploited and deprived - Brahmanism and Capitalism – that Dr Ambedkar had underlined in a workers’ conference at Manmad. How far the movement has progressed in his tactic of developing a common platform with the left, democratic and progressive forces to achieve extensive and deep transformation? This question can not be avoided. The party in power, which has no shame in proclaiming Ambedkar while secretly cherishing Savarkar-Hedgewar-Golwalkar in their heart, needs a Dalit politics which will dance to their tune. Real Ambedkar is anathema to them; they want sanitized, harmless Ambedkar. In this context the gap between what they say, and their actions is becoming clear. They not only want to attack programmes of positive discrimination like reservations, their economic policies and social agenda has been a disaster to Dalits and others on the margins of society. Needless to say there has been a strong reaction to this deceit and hypocrisy of the government about Ambedkar. It is evident that ever since Modi led government came to power in 2014, incidences of Dalit assertion are on the rise, and every successive incidence has drawn in more popular support. Whether it was the successful agitation against the ban on Ambedkar Periyar Study Circle in IIT Madras, countrywide agitation by students against the ‘institutional murder’ of Rohith Vemula by Hyderabad Central University, popular mobilization against the BJP government’s decision in Maharashtra to demolish Ambedkar Bhavan in Mumbai, successful agitation by Dalits in Punjab under the leadership of revolutionary left to occupy land and start experimenting with collective agriculture, or the Dalit revolt in Gujrat after Una against cow-terrorists which raised the historic slogan ‘you keep your cows’ tail, give us our land’ ; it is evident that Dalit assertion is sharper, more militant and also more extensive. The truth of the hegemonic Hindutva agenda is out. The livelihood and the right to organize of the oppressed and exploited are under attack. They want to crush any form of Dalit assertion. Yet, in their anxiety they are also trying to appropriate Amdedkar. It seems battle lines are being drawn from both sides. The leader of Bhim Army, Chandrasekhar Azad Ravan is behind bars. It is well known that the social and cultural movement led by his organization in Saharanpur and neighbouring areas has unnerved Hindutva forces. It was not without reason that when the Allahabad Highcourt granted him bail, he was immediately arrested again under the National Security Act. It needs to be noted that if attraction for the BJP among a section of Dalits, for whatever reasons, in 2014 elections was one of the reasons for Hidtuva’s success, the increasing assertion of Dalits now is the proof that they can not be fooled any longer. It is essential now to discuss if identity (Asmita) should remain the focus of the Dalit movement, or as it came out in Una movement, the question of basic economic rights (Astitva) should also be a slogan. In this struggle for fundamental change it will be essential for the Dalit movement to identify its true friends, and implacable enemies.